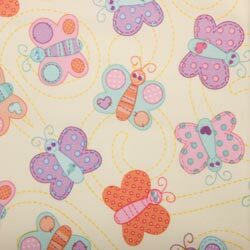 A printed polyester PUL fabric - this print comes with butterflies and swirls on a lighter yellow background. Fabric is about 64" wide and is shown at approximately 50% of actual size. This is the perfect choice of fabric for making all-in-one diapers, diaper covers, bibs, diaper bags, wet bags, changing pads and more!! This fabric has been tested and proven to be safe for baby. Although this fabric is a very durable printed PUL fabric, it is not as durable as the solid color PUL that we carry. However, it is a very nice choice if you want a print instead of a solid color. You can machine wash and dry this fabric; however, it will last longer if it is treated with a little care. We prefer to wash on warm and hang-dry items made in PUL to keep them looking nicer for a longer period of time.